By Norman Chan on June 25, 2013 at 7:30 p.m.
For the past week, I've been testing the new 11-inch MacBook Air. This year's model is interesting because it's one of the first laptops available with Intel's Haswell chipset, because of Apple's extremely bold claims of battery life, and because what Apple didn't change is very telling about the future of the MacBook Air line. Here's what I found. Just from their looks, you'd be hard pressed to tell the difference between the past four generations of Apple's 11-inch MacBook Air laptop. * Since the ultraportable laptop was introduced in the fall of 2010, Apple has stuck to a singular design, putting the vast majority of the upgrades for each subsequent model on the inside of the unibody chassis. A faster CPU, faster memory, more storage, Thunderbolt, USB 3.0. 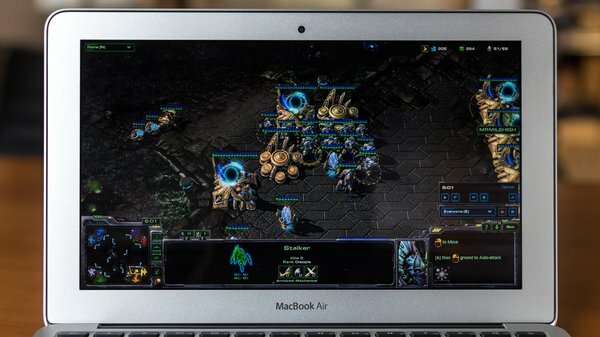 These internal improvements turned the MacBook Air into an increasingly viable desktop replacement, shedding the compromises Apple had to make to design a laptop that's still one of the smallest and lightest in its class. That's my favorite thing about the 11-inch MacBook Air, which I've been using as my primary work computer since 2011. 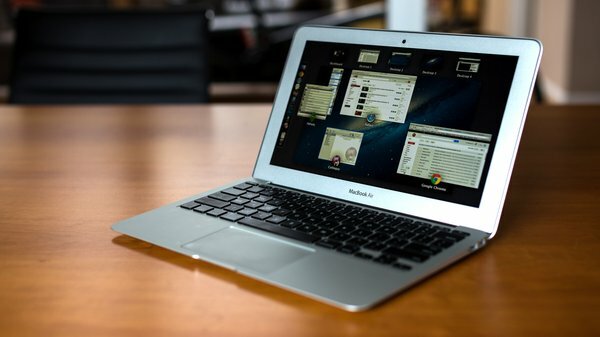 It has desktop-grade performance in an 11-inch formfactor, and can still be connected to a large monitor and accessories to serve as a desktop computer. And at 2.38 pounds, tossing it in my backpack for day or week trips is an afterthought. That's why, despite its smaller battery and lower-resolution screen than what's in the 13-inch model (in addition to not having an SD card slot), I prefer the 11-inch one. For the past week, I've been testing the new 11-inch MacBook Air, which Apple announced on June 10th at WWDC. While I was not technically "due" for a new laptop, being perfectly happy with my 2011 Air, we wanted to test this new model for a couple reasons. This year's MacBook Air is interesting because it's one of the first laptops available with Intel's Haswell chipset, because of Apple's extremely bold claims of battery life, and because what Apple didn't change is very telling about the future of the MacBook Air line. So in choosing a MacBook Air model to test, I configured the one that I would buy for myself. That doesn't mean the most decked out model, either. I chose upgrades that I thought would provide the most meaningful benefit for the cost difference, given the bottlenecks I've run into with my current laptop. With my Sandy Bridge Macbook Air from 2011, I bumped up the RAM from 2GB to 4GB, the flash storage from 64GB to 128GB, and the CPU from the Core i5 1.6GHz to the Core i7 1.8GHz. That memory and storage configuration proved to be inadequate for my daily work, so for this year's model, I bumped RAM up to 8GB and storage to 256GB. It's interesting that the 128GB storage difference between the "base" and "high-end" pre-configured models sold in stores costs $200. Last year, the difference between 64GB and 128GB in the 11-inch cost $100, and the difference between 128GB and 256GB in the 13-inch model cost $300. This shows both how much flash storage prices have come down one year later and also where Apple's costly upgrade margins still lie. No CPU upgrade this time, given that Haswell is a significant upgrade to the Sandy Bridge performance that I'm used to (and still frankly happy with). 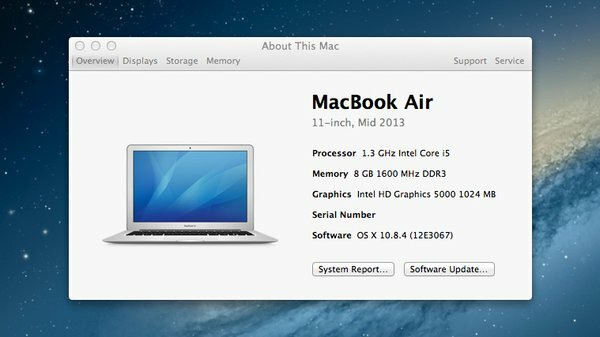 Both Core i5 and Core i7 Haswell chips available in this year's MacBook Airs sport Intel's HD 5000 graphics, which has 2.5 the number of execution units as HD 4000 graphics in Ivy Bridge. So I'm going to get the gaming benefit no matter what, and am mostly settling for lower clock speeds. The Core i5-4250U chip in this laptop clocks up to 2.6GHz on full load when plugged in to an outlet, and clocks to 2.3GHz when on battery power. It's no slouch. Final price after upgrades, tax, and shipping: $1430. So onto the testing. I have to be honest, in day-to-day use, it was difficult to notice much performance difference between my two-year-old MacBook Air and the new model. I run Mac OS with two web browsers open (Chrome and Safari), about 25 browser tabs total, Photoshop, Adium, and Spotify. Using those programs in everyday tasks felt not much faster than before. Batch processing images and Photoshop and exporting photos from Lightroom was sped up by 10%, and I expect that delta to be even more diminished if you're comparing to an Ivy Bridge MacBook. The consensus from other reviews is that Haswell achieves performance parity with Ivy Bridge while consuming less power, using a combination of the 22nm process and a lower max TDP. The improvements here are in battery usage, not speed. The extra RAM contributed the most noticeable benefit, as the OS has to rely less on virtual memory and taking up drive storage. One thing I have also noticed is that this MacBook runs considerably cooler than previous ones--even when running processor intensive tasks the laptop never became too hot to use on a lap. 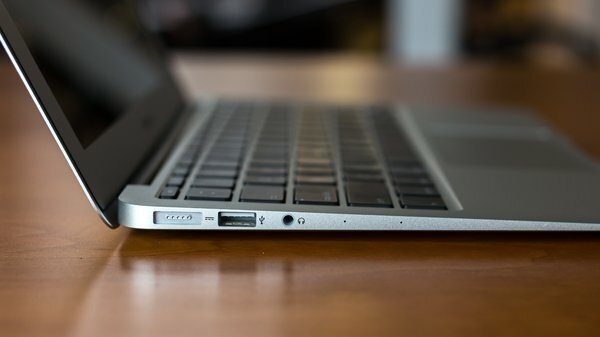 A significant shift in this year's MacBook Air is the use of the PCIe 2.0 interface for flash storage as opposed to SATA. Apple's use of PCIe-based SSDs (made by Samsung) not only reduces the hardware footprint, but also taps into the potential 1GB/s data rates offered by the interface. 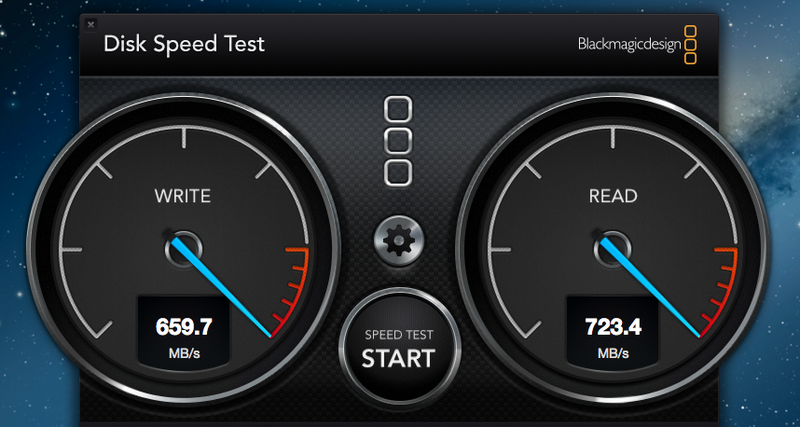 Speeds don't quite reach 1GB/s, but hit the 600-700MB/s range in synthetic tests. Keep in mind that you get faster write speeds with denser modules, so a higher capacity SSD will be faster than a smaller one. In practice, the PCIe SSD wasn't world-changing for everyday tasks, but bootups were slightly quicker and photo apps like iPhoto and Lightroom loaded a bit faster. What PCIe storage really means is that you'll be able to take full advantage of transfers from external drives over Thunderbolt. All right, on to the battery testing, because that's what you really care about. I think "objective" battery testing is a silly concept, because it's only useful if you can replicate the process across multiple machines for the purposes of comparison, and even then you're running into inequities like software versions and the age of the battery. It's also difficult to directly compare a new MacBook to a new Windows laptop because there are so many different hardware variables, like LCD luminosity, wireless radios, and physical battery capacity. Are you testing the OS at that point or the laptop manufacturer's ability to leverage the most run time per watt hour? 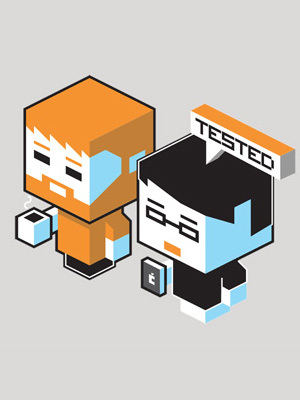 Instead, I prefer task-based testing, which gives less an impression of how long you'll be able to do a task (eg. nobody is really streaming YouTube video for six hours straight) and more of an idea of how different tasks affect battery usage. When you compare the battery efficiencies between different tasks on a single machine, you get a better sense of the overall efficiencies of this specific hardware configuration. For all of my tests (unless specified), Wi-Fi was enabled and brightness was set to 50%. Apple's own battery estimates assumes brightness set to 75%, but I find that MacBook displays are typically brighter than those of other laptops. The first test consisted of two days of normal work, which meant keeping 25 browser tabs open, constant web browsing, watching 15 streaming videos, participating in a 1-hour WebEx conference, and typing in Google Docs. I consider this a heavier load than Apple's testing, and in both days the MacBook Air lasted around 6 hours 45 minutes. When doing nothing by streaming a 720p video from YouTube, the laptop lasted 5 hours 45 minutes before the MacBook shut off. 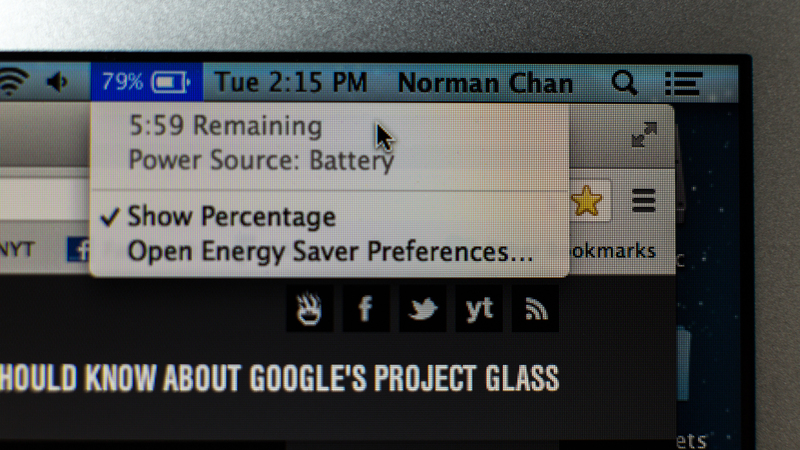 A full session of Lightroom 5 RAW photo editing lasted 4 hours 30 minutes before a 2% low battery warning. In "Airplane mode", meaning turning off Wi-Fi, reducing brightness to 40%, and doing nothing but typing in TextEdit and playing back a local Spotify album on repeat, the MacBook lasted a full 10 hours. Finally, online gaming in StarCraft II multiplayer lasted 1 hour 50 minutes before the game was unplayable due to low battery. These numbers tell me several things. They tell me that the MacBook Air is right at the cusp of being a machine that I can use for a full day without having to charge it. It never quite hit the 9 hour battery life claim while doing "real" work, but I caught myself glancing less at the battery percentage indicator during those two "working day" tests than I have ever done with an ultraportable laptop. Even when my battery was at 15% health, seeing that that meant more than 45 minutes of estimated usage time left was bewildering--my gut thought at that point was to find an outlet, but in actuality I could continue working and finishing the task at hand. The 10 hours I was able to pull from the battery while simulating a disconnected airplane mode was also revelatory. This laptop becomes a useful device for flights--Lightroom editing on a two-hour flight is possible, and you could even get by with simple word processing on a cross country flight. That's seriously awesome. The biggest surprise was how well the MacBook Air (and Haswell) handled gaming. Even when running on battery--and consequently, at below peak CPU/GPU performance--games like StarCraft II and Team Fortress 2 ran smoothly at native resolution, even hitting 60fps in TF2 with graphics set to medium. Not having to turn graphics all the way down to get a passable gaming experience makes this a genuinely viable casual gaming machine. It might not tackle BioShock: Infinite exceptionally well (according to Anand's benchmarks), but it should be able to run most indie games. This still isn't a laptop you would buy for the purpose of playing games, but it's nice to know it's possible (especially with BootCamp). The increased battery life of the new MacBook Air puts it on the level of a modern smartphone in terms of mobility and unplugged use. Like my phone, I'm finding that I use the MacBook Air unplugged for almost all of the day, only having to really charge it at night (a full charge takes two hours, by the way). It hasn't quite reached the level of the iPad, a device that only needs to be charged once a week. But it's easy to see that's where Apple wants to take the MacBook Air. A Retina screen would have been nice, but the tradeoffs wouldn't have been worth it. Most users would prefer longer battery life to a higher-resolution display or a heavier design. This new MacBook Air is really nice, but if not for testing, I wouldn't have made the upgrade. I'm under the belief that two years is too short of a upgrade-cycle for laptops. Upgrading a laptop every three or four years makes sense, given the pace of laptop technology, battery capacity depreciation, and operating system update support. The generous battery life and faster graphics of the new MacBook Air affords new usage opportunities that just weren't possible with my Sandy Bridge model, but I don't think they're worth another $1400 so soon. And if you bought an Ivy Bridge MacBook last year, be happy with that and make the most of it unless you have an uncle named Pennybags. But if you really are due for a new laptop and want to buy a Mac, this 11-inch MacBook Air is what I'd get. Improvements in battery life--and the increased mobility granted by it--is the trajectory Apple is taking with the Air line, and this year's model made a big leap in that direction. *For the detail-obsessed, the physical differences between the four 11-inch Macbook Air models are as follows: 1st gen didn't have backlit keys, 2nd gen had backlit keys with MagSafe 1, 3rd gen had Magsafe 2, 4th gen has two microphone holes on the left side.